Handmade soap is a very old craft. Soapmaking was even a social event for the pioneers of this great nation. Although, making handmade soap uses basic ingredients and a fundamental process, it is by no means easy to make a high quality bar of handmade soap. Handmade soapmaking has been refined, but the craft itself has not changed much. Handmade soap's cold process uses the basic ingredients of fat and lye. Lotion Lady® handmade soaps do not contain animal products for the fats. Only high quality vegetable oils are used. Added to the ingredient list are quality essential and natural fragrance oils. The goal is to create a bar of handmade soap that performs well, has a natural scent and is good for your skin. The lye solution must be made using cold water. It will heat up to 200 degrees. So, it must cool while the oils are gently heated to the precise temperature for mixing. You'll need a laboratory thermometer. The lye solution should be poured into the oils, not the reverse. A stainless steel or enameled pot should be used, not aluminum nor iron. 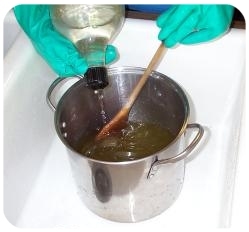 Not to be confused with melt-and-pour glycerin, this is soapmaking using the cold-process method. It requires patience, concentration and safety. Lye burns. Protective gloves and clothing should be worn including a face shield. Vinegar should be kept handy to rub on your skin should it come in contact with the lye. Keep children, pets and all distractions away during the entire process! 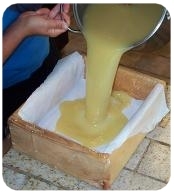 Once the lye solution and oils are combined, the tedious process of hand stirring begins which can take over an hour. This is a lengthy step, but very important. If not done properly, the batch will be defective. When the mixture is ready, it will be poured into a mold similar to the one on the right. It must then be carefully moved to a place where it can saponify undisturbed. It can still cause severe burns, if it spills during this process. After saponification, the caustic alkali (lye) is neutralized. The result of this chemical reaction is soap.